Two months ago I found a set of flashcards with IDE shortcuts and started learning them. After using the cards for some time, I noticed that memorising all the shortcuts is really hard for me. While many key combinations are sort of mnemonic, e.g. Ctrl-Alt-m to extract a method, some are not, e.g. 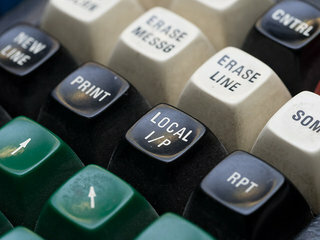 Ctrl-Alt-l to format the source. I struggled to remember the shortcuts, mixing up the modifier keys all the time. It was frustrating to answer a card wrong for the n-th time and I had to reduce the number of cards I studied each day. There is not much information in a key sequence like Alt-F12 to make it a reasonable entity to remember. There is no story around it, nothing to relate to. I have heard of people being able to remember huge numbers by translating them into sequences of pictures - a story, which is much easier to keep in memory. On my German QWERTZ keyboard there are 105 keys. Ignoring the number block and a few other keys, there are up to 70 keys which might be used in shortcuts. There are three modifier keys which can be combined into eight combinations. (I ignored the Windows and Menu keys and till now have not seen an IDE that made a difference between left and right Shift or Alt.) Not all combinations of keys are special, e.g. Shift-a is just an A - I counted 400 potential shortcuts to activate IDE functions. Further some shortcuts mean (hopefully similar but) different things in different contexts, e.g. inside the editor window or navigator. I do not know how translating the shortcut into a story might help, but I will experiment with hints for modifier combinations at least, because I never seem to get them right. Changing the order of modifier keys between shortcut descriptions makes things more difficult and I have not found an order which is easier to remember for me. Any ideas anyone? Maybe some research is needed: The Control key was created to zero the leftmost two bits of the generated ASCII character. This created values below 32 which controlled where the next character would be placed on the display device. Its symbol is the helm, U+2388 (⎈). The Alt key was used to set the high bit of the signal generated by the other key. Its symbol is the alternative key, U+2387 (⎇). The third modifier is the Shift key, shown as an upwards white arrow, U+21E7 (⇧). It is the oldest of the three keys as it was used in typewriters to shift up the case stamp to change to capital letters. By position on the keyboard and their prior usage, I sort Control before Alt, as in Ctrl-Alt-Delete. I am not sure where to put the Shift. JetBrains' Help puts the Shift between Control and Alt. The question for me is if Shift is a part of the character, e.g. uppercase A. I will have to experiment with Ctrl-Shift-Alt-something and Ctrl-Alt-Shift-something. I noticed that I take visual hints from the question, i.e. the typeface and text describing the shortcut, e.g. "Switch between views". Maybe that is how the brain works but this is not the kind of memory link I want to establish between the desired action in the IDE and the shortcut that activates it. Maybe I need a more visual representation to remember the shortcuts. The symbols (helm, alternate, upwards arrow) are very different and could be useful. I experimented with Anki and it is possible to add pictures to the flashcards. I plan to create a new deck of cards containing a picture marking the actual keys on a keyboard. I hope that the visual representation of the keys will help me remembering them. Unfortunately images if keyboards make some shortcuts layout specific, e.g. Ctrl-z is in a different location on an US/UK layout than on my German one. As I plan to master both layouts, I will have to create and study the visual layouts of the relevant shortcuts twice. Knowing the list of available functionality and their key combinations can only be the beginning of my "I know all shortcuts journey". There is no doubt I will need to practise typing them. I hope that knowing them will shorten the actual practise needed. Using flashcards allows me to study a few shortcuts whenever I have an extra minute, e.g. on the subway or when I am early for an appointment.